This is an invitation to exercise the faith muscle; our true trust in Adonai the Lord God of All. The idea of expectation when rightly directed produces Life. Expectations always point to our needs. Do we trust and depend only on God to meet our needs – every single one only by Him? The right direction is always up. .. not to the sky but the One who made it. When wrongly directed it produces death. The wrong direction is any other direction but up. This exercise requires that one commit to directing their attention to what is going on inside while one is doing something on the outside. Before one begins they must discern 2 things will happen. 1) The enemy will attack us. He will attempt to obscure what’s really happening inside. In so doing we give him control of outside, should we fall prey to the deception he will attempt inside. Therefore a prayer that first submits to Adonai in Authority to protect and guide us is key. Yet, note we must be sincere in our desire to see where we are bound up (correction) and be willing; no matter how offensive or hard the changing may be to do it, act on it. 2) That we will be tempted to think the exercise ends and we are done. Once you do this it will change everything. Begin to recognize what expectation feels like. It is sometimes very subtle and often seems innocent. Such as: when it’s direction is pointed at a loved one; spouse, child, parent, friend, coworker. Remember direction. Even the expectation of love horizontally is aimed in the wrong direction (except where we are giving it. Not getting). In relationship the expectations are numerous. Love, understanding, appreciation, being valued, being seen, recognized, needed, wanted. None of these are bad just directionally challenged. Anything can pull and tug on our expectations! Objects, such as computers, cell phones, cars, traffic, traffic lights, buttons, food, TV’s, weather, programs, and the like. Things that we do routinely everyday that we expect to go according to our expectations. Projects at work, schedules, and… time! Notice our expectations always revolve around us, our convenience, our need, our hope, our comfort. There is a big one. Expectations of ourselves. Very sneaky and often tricks us into thinking it’s the way “we keep ourselves in check”. Beware this one! Remember the direction, not in, across, down, over or beside, in front, behind… only up. Wow! How does this work? It will take all day! Lots of concentration! Yes. Now beware how even this exercise will try to divert our expectations! How does one go a whole day without expectations to or from anyone or anything but God? Sounds absurd and impossible. Nothing is impossible with God. So there, we see how we redirect the flow of expectation. If we notice it start to go in a direction other than up we redirect it. Example: One is about to hug a spouse (child; anyone). Expectation? Returned affection. Check, there it is. 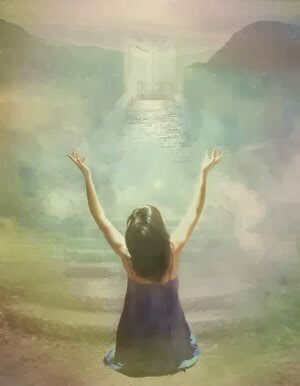 Prayer: Adonai I give my expectation of this to You, only You need to hug me back. I recognize that I’m to love, not expect to be loved in return. I place all my need for love in You and praise You that You do! Without my expectations You always love me. It is enough. Repeat this pattern for every single person or thing. Just for today. Then please, come back here and share the experience in the comment section below. Know there are no expectations from me or anyone in what you share or if you do. The results are truly between you and Abba. He is the One who will change and transform in the process. The sharing must be prompted by Him for the benefit of His body (the fellow-sheep). May Adonai bless, protect and defend you. May the redirecting of all things bring you face to face with Him and may all your redirecting bring you closer to Him.